When it was announced after the Disney acquisition of Lucasfilm, there were a lot of reasons to be suspicious of Star Wars Rebels, the second animated series from the Star Wars studio—starting with the fact that Disney insisted on shutting down its much-loved predecessor, The Clone Wars (2008-15), in the midst of production on its penultimate season. The pivot to Rebels was presumably based on the fact that the new show tied into a more beloved set of characters, and because its younger protagonists might be more engaging to younger viewers. But in many ways Rebels was clearly building on The Clone Wars’ foundations—and by the end of its second season, if not before, the show became what it continued to be until it ended this March: gripping Star Wars storytelling that pushed canon in new directions in terms of representation, scope, and meaning. Along the way, it became one of, if not the most, emotionally affecting Star Wars story I’ve ever found in any medium in any era. And because 2018 is a flaming garbage heap, not unlike the one in which the former Darth Maul survived for ten years with no legs (yes, this actually happened in The Clone Wars), it reflects a lot of the problems that are currently gripping mainstream fandom, Star Wars and otherwise. 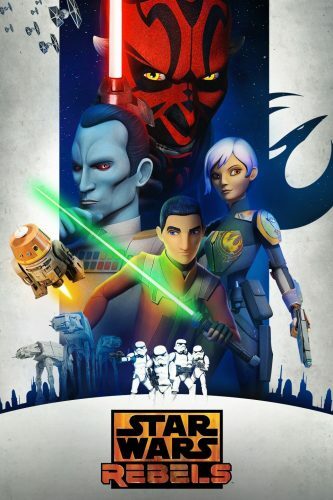 Rebels is not quite the “simple story” that the trailer for its final season claimed, but its descriptions of its main cast definitely ring true: a boy who was lost, a girl who was broken, a survivor, a war veteran, a fallen Knight, and their leader—a pilot who holds them all together. They are joined by cameo appearances from canon characters like Princess Leia and Lando Calrissian (voiced by Billy Dee Williams himself), as well as existing secondary characters like Mon Mothma and Wedge Antilles, and appear alongside new heroes and villains—some of whom, like the ISB Agent Kallus, are capable of sustained change in a way we didn’t necessarily see in the movies. The boy who was lost is Ezra Bridger, who is first introduced as a fifteen-year-old orphan questioning why he or anyone should stick their neck out for other people. Ezra is superficially extremely similar to Luke Skywalker: both are orphans growing up on backwater planets who turn out to be Force-sensitive and decide to join the fight against the Empire. In fact, we learn very quickly that Ezra is the exact same age as Luke and Leia, and that they may even share a birthday: Empire Day, the day that the Republic fell in Revenge of the Sith (2005). He quickly joins the crew of the Ghost, who at first just seem to be a group of malcontents who’ve managed to find each other and are resisting the Empire in an ad hoc, low-key way from their base of operations on Ezra’s out-of-the-way homeworld, Lothal. It quickly becomes clear that there’s much more going on and that Hera Syndulla, the Ghost’s pilot, isn’t alone in her desire to take on the Empire. Hera’s lover, Kanan Jarrus, is a former Jedi padawan who somehow survived Order 66 and isn’t happy about the idea of joining up with anyone. But Sabine Wren, a young Mandalorian who fled the Imperial Academy after her innovative weapons designs proved too effective, and Garrazeb Orrellios, one of the few survivors of the Imperial genocide of his species, the Lasat, are more interested in joining a more organized force. C1-10P, the astromech Clone Wars veteran who is by far the crankiest droid in Star Wars canon, just wants to blow things up: he likes Hera and babies and grudgingly tolerates everyone else, though he’s initially suspicious of Ezra. While the animation quality of both shows improved over the course of their runs, the increase in quality on The Clone Wars was exponential, while on Rebels it was more incremental: the focus on Lothal kept its art direction coherent from the start, drawing on Ralph McQuarrie’s original concept art for A New Hope (1977). The animation in Rebels is also flat-out beautiful, with the understated art direction familiar from The Clone Wars finally equalled by the technical capabilities of the animation software. Rebels built on The Clone Wars in other ways too, not only in terms of its deploying coherent season-long storylines from the beginning, but also in terms of deepening and tying together many of the running elements from The Clone Wars itself, frequently giving them a conclusion that wasn’t possible in the first show, the chronology of which was forced to fit entirely into the three years between Attack of the Clones (2002) and Revenge of the Sith. Sabine Wren herself, “the girl who was broken,” is one of the best examples of this quality, and of many of Rebels’ other standout points. A few years older than Ezra, Sabine is estranged from her people and her family, who chose loyalty to the Empire over loyalty to her, but she nevertheless provides a link to what happened to the Mandalorians after the rise of the Empire, eventually bringing full circle the saga of the darksaber and the ruling house of Kyrze from the earlier series. But Sabine is more than just a damaged warrior; she is also a gifted artist whose talents are praised by no less a critic than Grand Admiral Thrawn himself. It is her starbird street art design that becomes associated with the fledgling Rebellion, and her artistic talents prove crucial at several key points in the series. Though older than Ezra, she’s still young, and the two quickly develop a sibling-like bond that pays off richly in the series finale. Rebels truly excels in its female characters, not only in their number and quality but also in their variety. As well as being an artist, Sabine is notable for being the first major non-white human female character in Star Wars, with distinctly East Asian features. Before her, women of color had to look to alien women for representation in the Star Wars universe, and most of these alien women were depicted in extremely questionable ways, with the head-tailed Twi’leks being front and center: scantily clad actresses in full body paint were frequently depicted as “exotic dancers,” as at Jabba’s palace in Return of the Jedi (1983). The prequel trilogy improved representation in background characters—female Tholothian Jedi Masters Adi Gallia and Stass Allie were black, and female Twi’lek Aayla Secura was a Jedi Master and a general, while female Jedi Master Luminara Unduli and her padawan Barriss Offee were clearly analogous to hijabi women and Kanan’s own master, Depa Billaba, was portrayed by a Turkish-Indian actress, complete with bindi analogue—but not in all ways: even on the battlefield, Aayla Secura wears a sports bra and not much else. For all these reasons, Hera Syndulla, the spine of Rebels, is a marvel. The daughter of Twi’lek insurgent leader Cham Syndulla, who clashed with Mace Windu and Senator Orn Free Taa in The Clone Wars, Hera is one of the best pilots in the Star Wars saga and, by the end of the show, a general in the Rebellion with a gift for inspiring people. Unlike almost every other female Twi’lek in the saga, aside from a few of Cham’s partisans, she almost never appears less than fully clothed; instead, as befits a gifted pilot, she mostly wears flight suits, pilot’s caps, and outfits closely derived therefrom, and only deviates from these clothes for specific disguises. A child when the Republic fought to free her world in the Clone Wars, Hera grew up longing to fly, and she succeeds: in one of the show’s best episodes, she convinces a reclusive Mon Cal starship designer to let her take the B-wing bomber prototype on a series of test runs, and winds up leading multiple fighter squadrons for the Rebel Alliance. More than that, though, her empathy and knack for strategy are what keeps everyone on the Ghost alive and relatively whole. The other important female character in the show caused quite a stir when she appeared at the end of the first season: Ahsoka Tano, former padawan to Anakin Skywalker, whose choice to leave the Jedi Order in The Clone Wars’ final officially-aired episode left the show on an emotional cliffhanger. Evading the Empire, and now wielding white lightsabers as a mark of her non-allegiance to the Jedi, Ahsoka is revealed to have been working with Bail Organa to set up resistance cells across the galaxy. Soon after meeting up with Kanan, Ezra, and the Ghost, her presence attracts Darth Vader, who is tasked by the Emperor with succeeding where the Inquisitors, those Force-wielders who have been turned to the Dark Side to serve the Empire and root out all remaining Jedi, failed. First introduced as a brash fourteen-year-old in The Clone Wars movie (2008), by Rebels Ahsoka is cautious, mature, and undoubtedly one of the most powerful Force-wielders in the galaxy, more than capable of going toe-to-toe with Darth Vader. That she survived at all seemed miraculous, but her story is also the story of how her fate crosses with Anakin Skywalker’s but ultimately is her own. Compared with the examples of Padmé Amidala, Aunt Beru, Shmi Skywalker, and General Leia Organa, whose destinies are inextricably linked to those of the Skywalker men, the independence of Ahsoka’s narrative makes a powerful statement. Vader and Ahsoka exit the show at the end of the second season, and their place is filled to some extent by the irrepressible—and by now extremely loquacious—former Darth Maul, who isn’t one to be stopped from seeking revenge on the Sith who discarded him like trash after The Phantom Menace, despite being sliced in half by Obi-Wan Kenobi, surviving for ten years in a flaming garbage heap, conquering Mandalore only to lose it again, and subsequently spending a further prolonged period of solitude on the Sith world of Malachor (got that?). No longer a Sith, Maul is still a Dark Sider, and he explicitly wants Ezra for his own apprentice, trying multiple times to kill Kanan in furtherance of that goal. But Maul is also capable of working with Kanan, Ezra, and Ahsoka to get what he wants, as when he and Ezra unite a pair of Jedi and Sith holocrons to access the devices’ knowledge, ultimately leading them both to Obi-Wan Kenobi on Tatooine. With their final duel on the sand, Maul’s story comes full circle, and Obi-Wan’s heartbreaking Mandalorian plot line from The Clone Wars is resolved. One of the reasons I remain disappointed about The Clone Wars being cancelled is that the show was, covertly, one of the most fascinating science fictional explorations of sentience, free will, and agency of its era. As Bitter Gertrude puts it in the most incisive analysis of The Last Jedi that I’ve read , “The prequels were clear that we were all complicit in a corrupt system whether we admitted it to ourselves or not, symbolized by noble Jedi finding themselves leading an army of slave clones that were purchased from part of a massive military industrial complex.” The Clone Wars matched its consideration of the personhood of individual clones with its depiction of the ways in which the droid armies of the Separatists were no less enslaved, with some of its tensest moments circling around clone soldiers learning to defy their Jedi generals for their own good, even coming close to learning about the chips which would shortly compel them to execute Order 66. All of that was building to some kind of payoff which I can guess at, but which saddens me to never actually get to see onscreen. Even here, though, Rebels didn’t drop the ball. Indeed, the fact that Anakin’s former clone commander Captain Rex decides to join the Rebellion in the show’s second season was meaningful and delightful. (We learn in the show’s final moments that he even fought at the Battle of Endor, another thrill for someone whose favorite Star Wars film is still RotJ.) Rex and his friends, who’ve removed their chips, make their own choice to fight for the rebels, a choice that they were never given in the Grand Army of the Republic. Their interactions with Kanan, whose near-death at the hands of clone soldiers in his former life as the Jedi apprentice Caleb Dume left him with scars that aren’t physical, were also an exploration of the divisive legacy of the Clone Wars. There’s even a sly irony, and a telling comment, in the fact that the Clone Wars veteran who’s been with the Ghost the longest, in fact since Hera was a child, is the irascible droid Chopper, who fought for the Republic. The past several years have been heady times for Star Wars fans; the franchise’s canon has expanded rapidly through multiple media under the unified direction of the Lucasfilm Story Group, and the payoff so far has been handsome. I grew up reading the books that constituted the Expanded Universe, which declared dead in 2014 and relegated to the category of “Legends.” But via The Clone Wars, which alone of the non-movie media was ported over into the new canon, and especially in Star Wars Rebels, the EU lives on, enriching the wider franchise. These animated shows have meant that even some of the old EU’s wilder elements, such as the Force-witch Nightsisters of Dathomir, have been confirmed as fully canonical. No EU character is more iconic than Grand Admiral Thrawn, the warlord who in the early-1990s EU novels by Timothy Zahn takes over the remnants of the Empire five years after the Battle of Endor. Thirty years on, these remain some of the best Star Wars books ever written, and for fans like me who slaked our thirst on the books before George Lucas brought Star Wars back at the end of the millennium, seeing Thrawn and his personal assassin Rukh in actual Star Wars canon—and hearing his loyal captain Gilad Pellaeon get a shoutout in the Rebels finale—never stopped being awesome. But Rebels also used Thrawn as a tacit commentary on colonialism, the methods of the literal Empire which he serves, more insistently than the EU novels did. Blue-skinned, with black hair and glowing red eyes, invariably cold as ice under fire, Thrawn is a master strategist with a penchant for understanding his enemies through their art and aesthetics, the better to destroy them. In Rebels, he serves as the main antagonist for the last two seasons, as he tries to build his Death Star-rival project, the TIE defender, on Lothal and crush the rebellion—including Hera, Ezra, and their friends. Unlike some of the more classic Imperial characters, such as Lothal’s Governor Pryce, he never makes the mistake of underestimating the rebels, though he never does really understand the Force. Thrawn is a collector, and for him, understanding art is a way of entombing the cultures it comes from, a point that is underlined through his interactions with Hera in particular—at one point he presses her to divulge the meaning of one of her ritual household objects even as she’s being tortured. Completely unexpectedly, Rebels also links itself to, and doubles down on, the weird '70s mysticism that lurked in the deepest layers of George Lucas’s ideas in the era during which he was framing the saga as “extracts from The Journal of the Whills.” No less a sci-fi veteran than Tom Baker voiced the Bendu in season three, a Force-wielding entity of unknown origins and powers who befriends Kanan, telling him that “I’m the Bendu, the one in the middle” between “the ashla and the bogan,” which the Jedi and the Sith wield, respectively. The Mortis Force deities, who featured in one of the strangest Clone Wars story arcs, reappear in art in the fourth season episodes “Wolves and a Door” and “A World Between Worlds,” which blows the Star Wars universe and the possibilities of the Force wide open, far beyond what we’ve seen before or knew to be possible. I can’t spoil what was, hands down, one of the most shocking things I’ve seen in Star Wars; at a certain moment in the episode I sat up on the couch and swore out loud. But I can use this episode and all the series’ other echoes and reflections of the wider saga to talk about Rebels and its place in Star Wars overall. The Last Jedi is one of the greatest Star Wars films, for all the reasons outlined in that Bitter Gertrude piece and more besides. But one of the things that drove me up the wall about the criticism of the movie, not only as a female fan but as a Star Wars fan who follows the franchise in multiple media, was the ways in which quite a few of the elements in the movie singled out as “not Star Wars!” were actually callbacks to or elements that had already featured in Rebels, starting with Leia’s infamous use of the Force to pull herself back aboard the Resistance cruiser after she’s blasted into vacuum. The idea that “she couldn’t do that because!” was beyond infuriating, not only because it was transparent sexism but also because Kanan literally did the same damn thing in season three of Rebels, when Maul threw him out an airlock. I loathe the “fake fan” discourse with the fire of a thousand suns, but the canon parochialism of these criticisms is downright embarrassing. They also betray what seems to me to be a fundamental category error: Star Wars is space opera, not hard science fiction. Nor does it make any sense to say that “the Force doesn’t work like that!” The Force is what canon creators make of it, and we only know what we have seen so far. Likewise, when Grand Moff Tarkin (shown in The Clone Wars to have been a malevolent, power-hungry authoritarian even as a young captain in the Republic Navy) tells Darth Vader that the Jedi are over, that “their fire has gone out of the universe,” he sets up a narrative thread that might have easily made Rebels, set four years before both that movie and 2016’s Rogue One, a boring connect-the-dots exercise. But while, for example, Rogue One’s Saw Gerrera, originally introduced in The Clone Wars and played by Forest Whittaker in the movie, does indeed show up several times in Rebels, his plotline never takes over the show’s story. Instead, Saw’s choices inform and comment on those of the Ghost crew, who eventually play a key role in smuggling Senator Mon Mothma to her destiny of forming the Rebel Alliance from a scattering of disparate groups. Similarly, while Rebels does depict the winnowing of Force-wielders as the Inquisitors fall to their enemies, it ultimately tells its own story, centered on Lothal and the Ghost crew, and revealing the ways in which their actions matter both to the larger galaxy and for their own sake. Elsewhere, Ezra recapitulates/anticipates Luke Skywalker’s own journey as a Jedi, switching from a blue to a green lightsaber and getting a more serious haircut midway through the series. But his relationship with Kanan also adds new wrinkles to the familiar master/apprentice relationship: when faced with Ezra, Kanan reaches out rather than turning away, willingly returning to the path of the Jedi and eventually reaching the rank of Jedi Knight in one of the series’ many incredible moments. Together, Kanan and Ezra learn from each other and become their own kind of Jedi, not the same as Obi-Wan or Yoda or Luke, though their paths intersect with all of them at times. While Yoda is still (rightly!) hung up on the fact that the Jedi fighting in the Clone Wars under his leadership was clearly wrong, Kanan and Ezra are clear that Jedi fighting isn’t wrong per se; what matters is how they fight, and what for. Both of them struggle with their fears of losing the people they care about, a fear that Luke also faces in his journey. If Ezra’s story mirrors Luke’s in some ways, it’s because they are both Jedi trying to figure out what being a Jedi means after the end of the Jedi Order—not because they are the same character. People who love Star Wars and haven’t watched Rebels are missing out, hands down. The trick is that Rebels is an animated show, and animation is still associated with “kids’ stuff,” admittedly not helped by the fact that the last two seasons aired on Disney’s streaming platform. But it’s long past time to abandon the idea that animation is solely for children (and comic books somehow aren’t? Give me a break. (Also, the Star Wars comics have been pretty great lately too)), and Rebels demonstrates exactly why that is. To some extent, fan wariness of The Clone Wars was understandable, given that we were all burned by the prequels—though in the event, The Clone Wars maximized everything that was good about the prequels and shared remarkably few of their faults. Taking place as it does in the vaunted original trilogy era, there’s no such excuse not to watch Rebels. There are more stories to be told in the Star Wars universe than those we already know, and the Skywalkers are not the only Jedi. Canon is still (once again) active and open, and the only limits to what stories Star Wars can tell are in the minds of those who are creating it. “The power to destroy a planet is insignificant next to the power of the Force,” Vader tells the officers assembled on the Death Star in A New Hope, and they don’t believe him. Rebels shows some of that power in ways that no one could have anticipated. It also shows that the saga deserves the kind of fans who won’t let their preconceived notions keep them from recognizing the richness in front of them. For those who can, the Force will be with us, always.